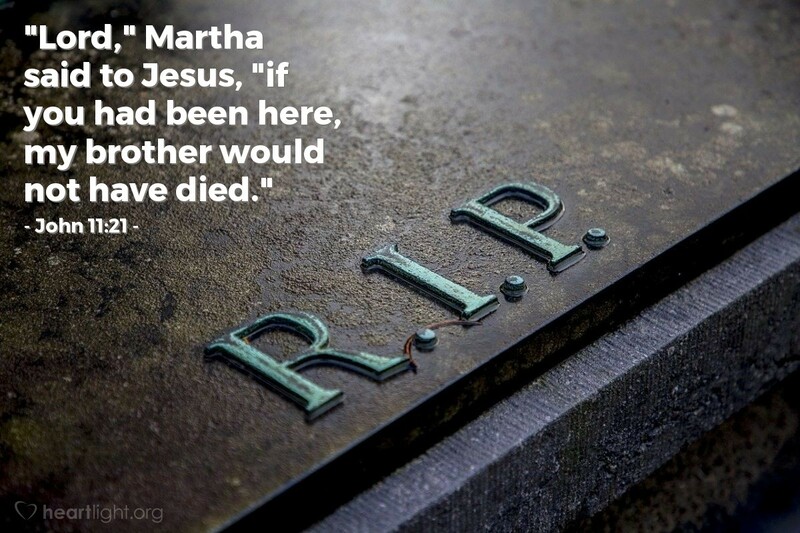 "Lord," Martha said to Jesus, "if you had been here, my brother would not have died." If you have ever stood at the grave side of a loved one, this thought probably crossed your mind, too — if you had only been here, Lord! Where is Jesus when we hurt? Why couldn't he be here to help us? There are a couple of crucial answers to remember. First, Jesus is with us in our moments of loss and grief. The Church is Jesus' Body and every act of kindness, support, comfort, and help is Jesus working to alleviate our grief. Second, while he may not have kept our loved one from passing from this life to the next, he has been the abiding and unbroken presence for each Christian who has died physically. Paul reminds us that when a Christian dies, he or she goes to be with Christ (2 Cor. 5:6-7; Phil. 1:21-23) and God's loving presence is never lost to him or her (Rom. 8:35-39)! Holy Father, please help me see Jesus' ministering presence in my times of loss and grief. Help me see him in the comforting presence of the Holy Spirit who abides in me. Help me see him in the acts of love and kindness your people do to help me. In addition, dear Father, please help me see ways that I can serve as Jesus' presence to someone else who is experiencing grief. In Jesus' name I pray. Amen.